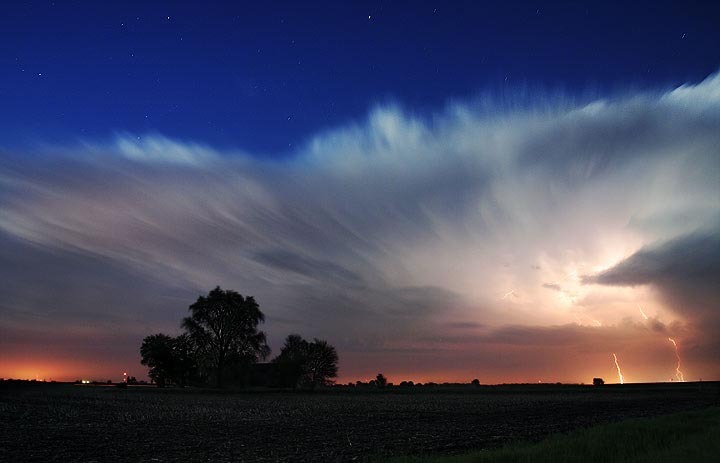 [Image: A passing Illinois lightning storm and supercell, the clouds peeling away to reveal evening stars; photo ©Extreme Instability/Mike Hollingshead. If you can overlook pet photos, meanwhile, don't miss Hollingshead's other storm work from 2006 and 2005 – including these Nebraskan auroras. While you're at it, this storm sequence has some stunning, pre-storm landscape shots]. (For more on the construction of continents, see The Transgondwanan Supermountain. For more on the exhibition now up at the MAK Center, download this PDF). Can I put in a vote to recreate the landmark storm of my youth: the great English "hurricane" of 1987. This would have to be a surprise, no-advance-warning, guerilla storm-event, with emergency supplies of tea for those caught unawares. And, importantly, the next day off school! Or the lightning storm during which Ben Franklin did the key thing. Or, speaking of Shelley, you could recreate the weather from that now-famous evening in Switzerland, when Mary came up with Frankenstein. See what ideas people come up with, the second time around. I know this is an old post but it is amazing. I originally studied meteorology and now am in locative media and currently working on augmented reality, architecture and spaces. What a beautiful rumination on an amazing site. I used to wonder about the mountain ranges east of the L.A basin and how it broke the desert storms down on monsoonal flows and kept l.a from that semi-ecosystem and how they broke down the western storms with drying thus making the desert....what would happen if an area was removed that allowed a channel between the two like a funnel effect? would storms find a narrow passage or would a beautiful multi layered and multi leveled ruin fan out of the crevasse? Very cool concept. I've lived all across the U.S. and experienced many of the different weather phenomena that we experience. It would be very interesting to be able to "re-create" weather from one part of the country for others to experience where they normally wouldn't.